Early in February 2017, Sony announced they will be releasing two 4th generation LCD laser projectors in June and August that, according to the information that’s been given, will blow it’s competitors out of the water! As some of you may know, Sony released the world’s first LCD laser projector back in August of 2013 – and it appears they are continuing to pioneer forward with these two new 4th generation laser projectors – especially since some manufacturers are still working on their own first generation laser projector! It’s no wonder that Sony has a pocket full of awards earned from their astounding-quality laser projectors. If you’d like, check out their YouTube video on how their 3LCD Laser Light Source Projector technology works. 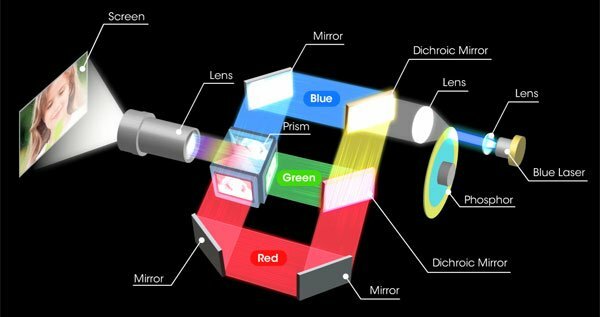 Sony’s Z-Phosphor 3LCD Laser Light Source Projectors incorporate a true laser light engine to produce exceptional Color Light Output. Their unique light engine uses a blue laser as its light source, which excites a phosphorous material that in turn creates full spectrum light. The light is delivered to a 3LCD optical system which results in constant, vibrant RGB color and two to three times the color brightness of single chip designs. The two new projectors are: the VPL-PHZ10 (WUXGA), which will be available in June, and the VPL-PWZ10 (WXGA), which will be available in August. What’s the big deal about these new laser projectors? 4.4″ tall x 20″ x 13.9″ – this is HALF the size of other competitors in the 5000 lumen laser projector class! 19.2 lbs – almost 50% lighter than previous generations! Now, perhaps the biggest kicker of them all? Both projectors will be available well under $3,000 – where competitors in this range easily cost over $3500 for a new projector! And, depending on if they are pre-ordered in quantity, it could be less than that! Now, for the first time, laser will actually cost less right from the start, than conventional lamp based projectors and over time, the total cost of ownership will be off the charts compared to the competition! We’re eagerly waiting to get our first look at these projectors, but it looks like this new Sony could be major breakthrough! We’re excited to share that we are anticipating getting our hands on a sample of these projectors in mid-March to get a first-hand look. We will be comparing them to competitor projectors like the highly popular Panasonic PT-RZ570 and the NEC NP-P502HL, among others – so stay tuned for our reviews and a new video! To ensure you don’t miss it, subscribe to our YouTube channel, and you can also follow us on Twitter, Facebook, Instagram, or Pinterest! This entry was posted in AV Solutions and tagged lampless projector, laser lite, laser projector, laserlite, lcd laser, NP-P502HL, projector, pt-rz570, Sony projector, vpl-phz10, vpl-pwz10, vplphz10, vplpwz10, z-phosphor.